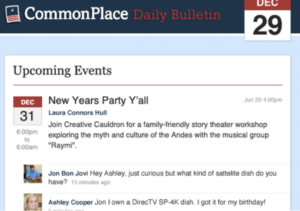 CommonPlace, the flagship project of the Laboratory for Civic Technology, is an online town bulletin that has proven to be the best not-for-profit, open source web platform for local community engagement. The civic tool makes it super easy for neighbors and civic leaders to share and connect with their town. Based on a successful pilot from 2009-2013, we are relaunching CommonPlace in full in Spring 2017. Everyone has to verify that they actually live in town, fill out a basic profile and agree to community norms. Town bulletins are beautifully designed emails that contain all the posts, events, and announcements from neighbors, local groups, and civic leaders. Skip the cork board at the grocery store. 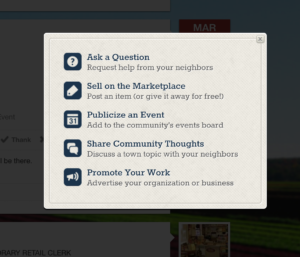 Visit your town’s CommonPlace any time you want to reply to your neighbors posts and she your own questions, ideas, events or announcements with people in your town. From there, they can post their own announcements and events, which also go in the bulletin. 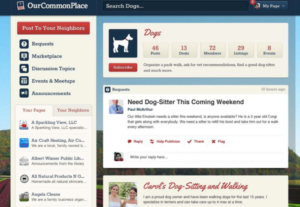 In January 2011, as students at Harvard College, we built the first CommonPlace platform and launched in Falls Church, Virginia. Within 12 weeks, 20% of the households in Falls Church had signed up to the network and hundreds of needs, events, announcements and private messages were sent and responded to across the network. Given the success in Falls Church, we hired a full-time designer and developer to update the platform. The following summer, we hired and trained seven community organizers and launched five more communities around the country: Marquette, MI; Fayetteville, AR; Warwick, NY; Vienna, VA; and Harrisonburg, VA. By the end of 2011, there were 5,300 neighbors signed up across six CommonPlaces, and over 100 local organizations signed up with pages. By 2012, our top three towns averaged 27.34% household participation in CommonPlace, with 8 posts a day and 11,309 monthly visits. By the end of our first wave of organizing, we averaged 4-10 posts per day in each network and had over 70% of our network engage with CommonPlace on a given day. Over 80% of all neighborhood needs received either public or private responses from neighbors. Even after the community organizers left, the CommonPlace populations grew steadily. Our beta test was: spotlighted in a blog post by the Harvard Kennedy School’s Saguaro Seminar on Civic Engagement in America; featured in various local news reports throughout the country; and given a community-building award at the Falls Church City Council chambers. After the beta ended, The government of the town of Warwick missed CommonPlace so much that they have organized a group to build their own version. The original expansion of our pilot was structured as a for-profit startup. We soon discovered this would not work: first, our devotion to community organizing did not fit the rapid growth models that Silicon Valley investors demanded; second, the idea of building civic life online inside of a for-profit entity did not sit well with us, with neighbors or with town governments. That’s why, in 2015, we launched the Laboratory for Civic Technology, a 501(c)3 non-profit with a mission to harness the internet to revitalize local community in America.